The percentages above is a general idea of where to allocate portions of your wedding budget. Whichever category is the most important to you will obviously have a larger portion of your budget dedicated to it. If you stay focused, then you should stay on course with the budget you had in mind. Percentages are calculated off the total cost of your wedding. 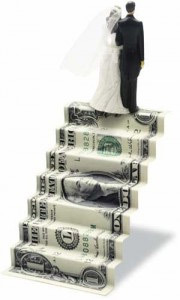 Example, if you are planning a $20,000 wedding, then $9,000 ($20,000 x 45%) should be set aside for that category. Who bares the burden for paying the bill is determined by family tradition. It can literally be done any way you like. Some cultures have relatives pay for parts as sponsors. It is best to sit down with both sides of the family to find out what they are capable of contributing. Keep in mind the more the families pay, the more likely they will feel the need to give their opinion on wedding planning decisions. Meal 0and alcohol – what kind of entrees, is this non-alcoholic, cash bar? How will the food be served? Floral – What type, how many, is everything fresh? Rentals – Are you considering renting a photo booth? Your budget should be created around that fact that nothing is set in stone. If you stay flexible on the percentages, then you can adjust for last minute changes. A majority of wedding vendors have package upgrades and add-ons. These can be decided on last minute as you get closer to your wedding date. By then you will have a better idea of how much is left in your budget. Also, some companies will give you a break in price if you decide to add-on something the week of your reception. Upfront costs are typically 50% to reserve your date when the contract is signed. Due to the nature of the business, these are non-refundable. Outstanding balances due date will vary but the standard is 2 weeks. We encourage you to use our advice and formulas above to create a boundaries on what is important and how much to spend. Analyze your budget every week to ensure you don’t start overspending funds you don’t have available. I know how hard it can be to say no to something you really want, but with a budget you will be able to accomplish more with less. Keep track of how much you paid to who, when the next payment is due, and cancellation policies. One again congrats on upcoming reception and be sure to leave your comments below!